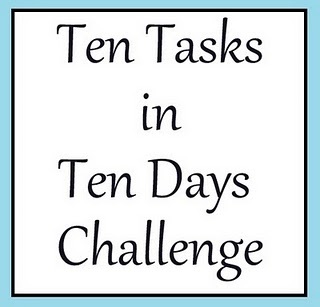 Gina over at "The Shabby Chic Cottage" has thrown down the gauntlet to complete a "10 Tasks in 10 Days Challenge" and I think this is just the motivation I need to get some things on my (way to long) "To Do" list completed. So here they are, I may not get them done in this order but I will get them done. 1. Clean the fish tank. for the two events I have coming up. 4. Finish my first mosaic project. 5. Clean out kitchen drawers and cupboards if i have time. 6. Scan the rest of my photos. 7. Finish all of my ironing. 8. Clean out and declutter linen closet. 9. Plant my Lemongrass into a pot. 10. Go for a nice drive and a relaxing lunch. 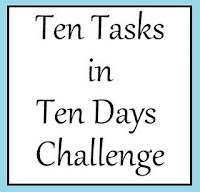 As I am a day late starting I guess I am going to have to do two on one day. If you would like to join in, it's better late than never. Just head on over to "The Shabby Chic Cottage" and link in. Great list! Have fun working your way through it all. I know you can do it! Oh my goodness....you are brave. I'm still in Yellowstone so can't think of anything to accomplish here other than packing up and getting back to civilization. I'm glad you threw in some fun things.